I love wrasses too! They are such a colourful addition to the reef and they generally are open water swimmers which adds nice movement. Yeah, I learnt that mistake the hard way, I was considering getting rid of the secretive wrasse (if I could catch it) but I do like the fish. He is colourful, inquisitive and is always out and about. On the other hand my Melanurus wrasse is a total fraidy cat though and gets pushed around by the kole tang quite easily. Yellow coris wrasses have become quite popular here lately so I'll add that to my list also. I did have a candy stripe hog fish at one stage in my cube also, a really nice fish. 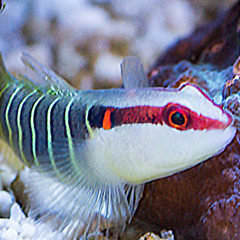 A fairy wrasse is a nice option though, my LFS has been getting some really nice pairs in lately. The Solon or Equisite are nice options as well, I've had my eyes on a Solon for a while but thought they may be too large for my tank. Too many options! Thanks for the input though Felicia! You're very welcome! I have to resist my wrasse obsession with my new tiny tank. I've loved the wrasses I've had over the years though. I'm with you on loving the fact that they're colorful, open water swimmers. I've had a few timid ones, but most of mine have been pretty spunky. I think there are a ton of good options in the wrasse family that could hold their own with the mystery wrasse. I'm surprised your melanurus is a scaredy cat. Mine didn't give a flip about anything. He was in a tank with 3 lionfish, a crazy eel, and a tomini tang and he was just like whatever and did his thing. He was a huge super male though. How big is yours? From my experience with wrasses in the 40B, I think 55 gallons is enough for pretty much any of the fairy wrasses. You don't have quite as long of a tank for swimming room, but I think they'd do fine. They are definitely one of my favourite species to have in the tank that's for sure. My Melanurus is probably about 3-4" at the moment, probably 3.5". He was the top dog until I introduced the Kole Tang. He is very jumpy and will hide when you walk close to or past the tank. If you stay and wait a while near the tank he will come out and swim around but more often then not he will dive straight into the sand and I won't see him for a few hours, he has missed many feedings because of this haha. My tank is a little odd on the dimensions as it is quite deep front to back and just a tad shorter than 3' long but when viewed from above there is a lot of open water. Im in the process of planning a minor re-scape to add additional rock to the display tastefully, I want to get all of the LR out of my sump. It would be a shame to let the rock go to waste so I want to use as much as I can. I'll be substituting the rock in the sump with Siporax (as it has superior filtration qualities). Now that the clown is gone and I can work in the tank without constant hand biting this is something I want to push ahead with. I'll leave any new additions until after this though, last thing I want is to startle a new fish and have them carpet surfing while i'm working on the tank. Hey Gena!!! 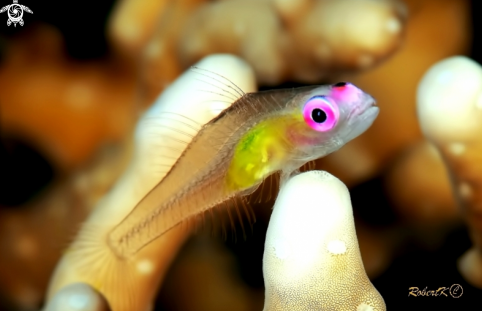 I do like little gobies, the thought crossed my mind to get a couple of clown gobies. I did have some in my old tank, my only concern would be the happiness of my SPS. In that case I would recommend green banded gobies. But I bet those are impossible to find there. And if you do, they'd probably be really expensive like the royal gramma. But wouldn't it be neat to have a few of those in your big tank . If I had to suffer!! And sharing is caring, right?! To be honest I have never seen them available here, they are cute fish though. We don't see too many gobies, jawfish or a large variety of blennies as they aren't locally sourced. I know a local reefer has been looking for a tailspot blenny for ages now and an importer quoted them $200AUS and a 6 month wait. I will take a look into what I can source locally though, I may find a few gems. And yes, only a little bit mean . No fish or coral available on eBay Australia though I'm afraid, you aren't allowed to sell live animals on there. Even facebook pages get shut down over this also unless they are backed by an LFS and are just advertising in store stock. And yes, only a little bit mean . No fish or coral available on eBay Australia though I'm afraid, you aren't aloud to sell live animals on there. Even facebook pages get shut down over this also unless they are backed by an LFS and are just advertising in store stock. Hahaha...yeah, that would have been ideal for him . Gobies are my favorite fish. I bet you can get some neat ones that we can't get over here. I've been wanting one of these guys FOREVER!!!!! Unfortunately they like to nest in SPS. Which wouldn't be a problem for me LOL. Plus I don't think they've ever been available. Not yet anyways. One day someone HAS to be able to collect them . That is a very cute fish! I'll have to see what I can find locally. My partner likes to be heavily involved in the tank selections. If she doesn't like the fish/coral I have to try and hide the purchase from her haha. Ooohhh...that's nice too! Have you heard if they've been collected? The pink eye has not. I'm not sure why though. They hover by the dozens above SPS corals. They must be really fast LOL. My current fish wish list is as follows, mostly wrasses but a few others. I know I can get most if not all locally if I really want. I can probably only add 1-2 of the larger wrasses at maximum, I think there may be territory issues with my existing wrasses and the Kole tang. Lots of options to choose from, I'm sure over the next few months I'll cut this list down or add things haha. After seeing the settings Dave is using on his personal NB over his tank I have played around with mine a bit. Traditionally I have run a fairly white tank. I generally like to see the corals in a more natural state and when shopping for pieces I'm not usually drawn in by their florescence as i typically don't view them this way. I've tweaked the settings a bit to get a little closer to what Dave is running without delving too much into blue. I never realised how over powering the white channel on the NB arrays could be until I starting messing around. My old and new settings are as follows. As you can see, not a huge amount of difference but the changes to the white channel makes a massive difference to the overall look of the tank. I'll run with how it is for the next few weeks and see how everything goes. That's pretty much the way I've adjusted mine over time. Just a little white/lime goes a long way. And my acans color up a lot better when there's less white light. I'm wondering if the added white is why I've been having some colour issues also. We shall see over time how the tank changes. I'm really looking forward to seeing the tank when I get home from work this evening. I know! I have taken pictures, I promise. I've just rebuilt my PC and have been too lazy to install LightRoom and PhotoShop to tweak the images. I need to make the time amongst other things. The whole installation won't take all that long, I'm just a compulsive procrastinator haha. I actually sat down to do it last night but got a call from the builder about my house and spent 45 minutes running through some things that ate all my available time during the evening. I think I'm right back to having about 3 months of photos to catch up on now haha. Better than the 8 months or so I had before though. I may or may not have edited some photos last night... Gotta repair a laptop tonight though so fat chance I'll be able to post any of them up .